Regularly ranking high on the list of the greatest places on Earth to live, visit Copenhagen and you'll quickly appreciate why. Historic, hip and contagiously happy, it's large enough to boast all the attractions of a big city, but small enough to navigate on foot and squeeze into a long weekend. If you find yourself here for a few days, here's an insider's guide to the city. The city's busiest months come during the summer run of June through August, when the climate is at its warmest and the city is in full bloom. Temperatures reach their height in July, averaging 68°F. If you don't mind trading a few degrees, May, early June and September are slightly quieter options and have more affordable deals. For its location, The Square checks off every box, overlooking City Hall and as central as they come. One of the city's most historic hotels is D'Angleterre, a landmark building whose luxury appeals to passing royalty and rock stars. At the other end of the spectrum, Wakeup Copenhagen offers a great budget option with its small but sleek rooms. But for Copenhagen's kookiest stay, book the intimate, one-room hotel at THEKRANE – it's located in a former coal crane, overlooking the old industrial harbor of Nordhavn. Get your bearings on the city early by heading for the Round Tower. Europe's oldest functioning astronomy observatory stands 36 meters high and looks down on Copenhagen's cobbled streets. If you want more altitude, head for the tower at Christiansborg Palace (the Danish Parliament), which climbs 106 meters into the sky. The city's history stretches back more than 1,000 years and is visible wherever you roam. Christiansborg Castle is also home to the ruins of Copenhagen Castle, located under the Palace, while Amalienborg Palace was constructed in the 1700s and is considered to be one of the finest examples of Danish Rococo architecture. It also happens to be home to the Danish royal family, and while you may not catch sight of Queen Margrethe II, arrive at noon to see the changing of the Royal Guard. The National Museum is the standout in a city full of museums and home to, among so much else, an astonishing array of Viking artifacts. If you have time for more, head to Ny Carlsberg Glyptotek, whose displays of ancient and modern art are contained in a building every bit as impressive. The city's most iconic landmark stands on a rock by the waterside at the Langeline promenade, northeast of City Hall. Bronze and granite, and welcoming visitors to Copenhagen harbor for more than a century, The Little Mermaid was inspired by the fairytale of the city's most celebrated storyteller, Hans Christian Andersen. Be aware she's usually surrounded by tourists and mobile phones. Just south of the statue, you'll discover the old harbor at Nyhavn. Packed full of colorfully renovated townhouses dating back to the 17th century, it's also home to a growing number of chic cafés, sophisticated restaurants and popular with tourists and locals alike. Right in the heart of the city, just moments from City Hall Square, stands another iconic Copenhagen landmark, Tivoli Gardens. To describe the gardens as an amusement park is to miss the mark, for while it boasts rides and fairground stalls said to have inspired Walt Disney, it's also home to a number of high-end restaurants, historic buildings and lush flower gardens. For the full effect, visit at night when thousands of fairy lights turn the gardens into a twinkly wonderland. If you want to escape the city center, Copenhagen has two excellent and very different options – head to the beach or visit a cemetery. Amager Beach Park is an artificial island that stretches for two kilometers, drawing crowds day and night and offering views of the mighty Øresund Bridge, connecting Denmark with its near neighbor Sweden. Cemetery walking is a quirk of the Danes, who often stroll and relax among the city's dead. One of the most popular spots is Assistens Cemetery in Nørrebro, an oasis of calm and the final resting place of Hans Christian Andersen. Other excellent, less macabre gardens are within easy reach, including the King's Garden, Frederiksberg Gardens and the Botanical Garden. As home to one of the world's most decorated restaurant scenes, Copenhagen is a culinary powerhouse. If you can't get a seat at Noma, you have plenty of excellent alternatives in Gemyse, Amass and the three Michelin-starred Geranium, to merely scratch the city's culinary surface. For more worldly fare, Sanchez and Bæst offer some of the best Mexican and pizza in this or any city respectively. Don't head home without having sampled the classic Danish staple of Smørrebrød (open-faced sandwiches). It's done well all across the city, but particularly at Restaurant Kronborg, Fru Nimb and throughout the epic food market at Torvehallerne. And make sure to seek out La Glace, a Copenhagen institution sating your sweet tooth since 1870. United Airlines' partners fly to Copenhagen Kastrup Airport (CPH). 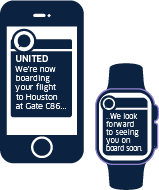 Visit united.com or use the convenient United app to book your flight. Copenhagen Kastrup Airport lies just eight kilometers outside of the city center, so you can be in the heart of the city within 15 minutes by taking the train or metro. Flat, compact and with a very walkable core, Copenhagen is very easily navigated on foot. Most points of interest mentioned below are within walking distance of the very central City Hall Square and the Central Station. To save your feet, buy a Copenhagen Card and you'll have unlimited use of public transport, including from the airport. The card also gives you free entrance to 86 museums and attractions, which includes the city's sightseeing boats that traverse the canals. Also, be aware that Copenhagen boasts one of the world's best cycle systems, with more bikes than inhabitants and 375 kilometers of cycle tracks. Most hotels and hostels provide bikes for its guests to use.